I typed up a short questionaire for people to fill out who come in my booth and show interest in my art. FREE research. I have so many people looking at my art, I figured it would be a good idea to find out what they are thinking and get it down on paper. I had the first person fill it out yesterday!! 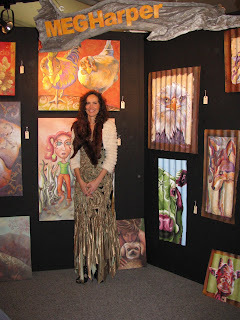 Here are the highlights: I asked what she felt when looking at my paintings. She said she loved the colors and felt energetic. She said if she had enough money to buy art she would purchase mine. Yeah! A future buyer!! How much $$ does someone need to make before they feel they can "afford" art. Interesting question to ponder for sure. I truly wonder what that magic number is for people. She suggested that I offer to paint customers owned animals. Pet portraits I believe is what she meant. And YES I am offering to paint pets and am looking for a commission to do right now as a matter of fact. I've done 2 commissions thru the show and they've both LOVED what I painted for them. I have attached Duke, my latest commission to share with ya'll. There were over 700 who attended an evening with the artists under the big top. There was great food, spirits, music and beautiful artists all dressed up and enjoying the evening! I met lots of great people and it was so fun where this beautiful outfit. I haven't gotten dressed up like this in a long time. This years Gala was the most attended one yet they have had! Today and next Thursday we are having a garden party from 4p-7p if anyone would like to come and enjoy fantastic apps. and art! This was the sweetest little guy ever that I've had the pleasure of painting. Wanted to share him with ya'll. The show is going really well. I've sold 3 paintings so far (Cowpoke Flo and a flower triptik on the tin) and the gala is coming up tomorrow night and I am super excited about it. Putting together some recycled art jewelry for the show as well on the recycled tin. Calling them mini-megs - come see me and my new pieces I've been creating at booth 78! !